Thanks to Susan J. Erickson for the heads-up. How’s your haiku? If you were participating in National Haiku Writing Month and lost your way, you have a couple more days to catch up before NaHaiWriMo ends. Of course, the prompts will continue (including prompts for the month of March by Paul David Mena) and there’s plenty of other inspiring stuff on the NaHaiWriMo site, Tumblr and Facebook. As NaHaiWriMo winds down, the Sue C. Boynton Poetry Contest is about to start up, with submissions accepted beginning Sunday, March 1, through Tuesday, March 31, 2015. If you live in Whatcom County, Washington, read the guidelines and send in your poems! There are surely many reasons to go to Scotland. Here are a couple. Should you find your calendar clear next week, hie thee over to St Andrews, Fife, for the 18th annual StAnza International Poetry Festival, which runs March 4-8, 2015 (with additional workshops on March 3). Each StAnza is organized around two themes; this year’s themes are Unfinished Business and An Archipelago of Poetry. The lineup of poets is impressive and sure to be inspiring. Much more information is available on the StAnza website. If dashing off to Scotland next week isn’t on your agenda, don’t despair. There is hardly a square kilometer of Scottish soil that hasn’t been commemorated in poetry…and it is all being mapped! The Scotland Poetry Map (a project of StAnza 2014) is a geographic guide to the poetic voice of Scotland. Take it along on your next trip. See it on the StAnza Blog. More StAnza Poetry on Facebook. You may already have heard of Jeff Goins. He blogs about writing and blogging. A while back, in the vein of NaPoWriMo and NaNoWriMo, he challenged writers to make a commitment to write 500 words a day for 31 days. There are no deadlines. It’s up to the writer to set a beginning date. Goins suggests blogging the daily 500 and linking your blog to his challenge page, which, so far, 1842 writers have done. The challenge is here: My 500 words. You can also join a My 500 words Facebook group for accountability and encouragement. Whether you choose to participate in Goins’s challenge, to write poetry or prose, to write 500 words or 250 or 1000, the concept is good: make a commitment and write every day. Don’t edit; don’t censor; just write. Then set the words aside; resist the compulsion to read them over and over; let them rest. After some time has gone by, go back and read what you wrote as if it was written by someone else. Let the editing begin. 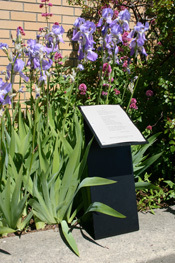 It’s a gorgeous day…for poetry in Seattle. 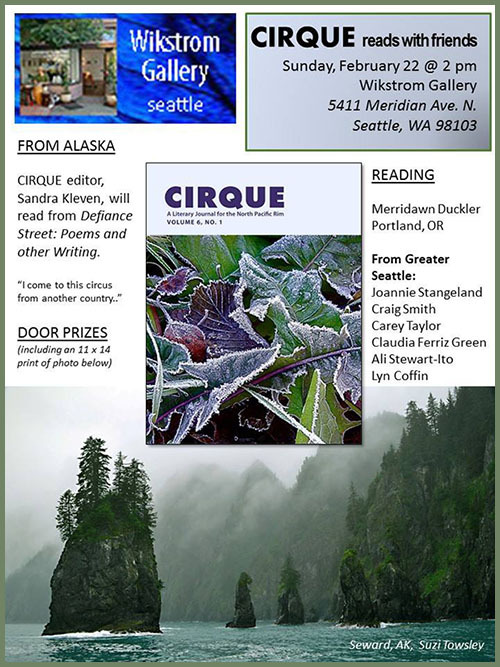 Come by the Wikstrom Gallery, 5411 Meridian Avenue North, at 2:00pm today, Sunday, February 22, 2015, to hear voices from the latest edition of Cirque Journal, including Joannie Stangeland, Craig Smith, Carey Taylor, Merridawn Duckler, Claudia Ferriz Green, Ali Stewart-Ito, Lyn Coffin and Sandra Kleven.